These bikes are more correctly called Barclays bikes, after the bank which sponsors them, but everybody calls them after London’s colourful mayor. In the central city you see stands every few hundred metres, and they can be hired with a credit card. I took the tube to Paddington station, and found one a few steps from the station entrance. 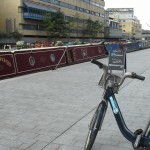 It was a bit disconcerting riding without a helmet, especially on the busy street, but very soon I found the start of the Paddington Branch of the canal, and left the traffic behind. The bike was very heavy and clunky compared to my own mountain bike, but I soon got used to it, and since the tow path is basically flat its lack of performance didn’t bother me. I was surprised how many canal boats there are moored in the canal, right in the central city. After only a few km however, the tall buildings were mostly replaced by trees and park-lands, and I began to feel like I was in the countryside. The canals are a bit filthy, and nobody seems to clear rubbish from the path, which is a bit of a pity, but I saw a lot of bird-life, and many pretty wild flowers. 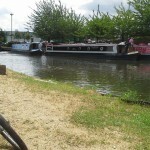 After 13.5 miles I reached the main canal and stopped for a lunch break. 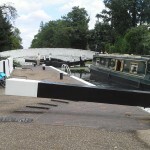 In the olden days these canals were the main transport route to the industrial cities of the north, but now they are only used by pleasure boats. 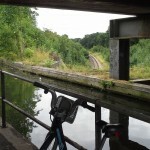 My original plan had been to bike as far as I could go then get the train back, but when I discovered that the path goes all the way to Birmingham 100 miles to the north, I decided to scale back my ambition and loop back to London via the Thames path. 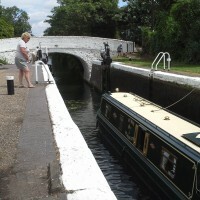 I stopped for 15 mins to watch a canal boat negotiate the Hanwell Top Lock, which was rather fascinating. This is very impressive technology. A little while later I stopped to take a photo of the Three Bridges, where the canal crosses a railway while being crossed by a road. 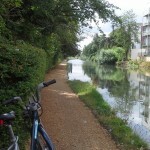 Eventually I reached the Thames, and had to resort to riding on roads again for a short distance. I could see a nice path on the south bank of the river, so I kept as close as I could to the river until I reached the Richmond foot bridge. As I lugged the heavy bike up the stairs I reflected how nice it is to own a lightweight model. I headed back east past Kew gardens along an attractive tree-lined path. I was starting to get a bit tired by now, and had a sore bum from the uncomfortable seat, so when I came to a spot near Barnes where workmen had blocked the path I thought I might end my journey and get the train home. I whipped out my tablet and searched for the nearest bike stand where I could end my hirage, and discovered to my dismay that they are really only in the central city, and that I had at least 10km still to ride. The detour wasn’t long, and I was soon off the road again and back on the Thames path. I crossed over the Putney Bridge and continued along the north bank, but it wasn’t long before the path diverted inland onto busy roads. They wouldn’t have been fun in ideal conditions, but I was tired, on an unfamiliar bike, and the traffic was starting to build up to the rush hour, so I didn’t enjoy the last half hour or so. I was very relieved to reach the Chelsea embankment and its shared path free of traffic. Finally I saw a bike stand, and was so keen to dock the bike and get off the seat that I didn’t realise that it is one of the few places in London where the nearest tube is over 15 minutes walk away! But the ride (probably between 50-60km in total) was well worthwhile and it exceeded my expectations.